Black Table Games | Smart card games you don’t have to be a genius to play. A fast-paced, competitive card game about building a giant robot and blowing up someone else’s. Order one copy for 2-player action or add a second copy for 4-player team battles. Smart card games you don’t have to be a genius to play. We don’t want you to feel like what you’re doing is arbitrary. That’s why we think of themes first and build mechanics around them. What you do in a game should be meaningful. You won’t find gigantic, intimidating rule books in our games. We want you to get straight to the fun as quickly as possible. “Easy to learn, difficult to master” is our mantra. It’s hard to get a group to commit to a game for 2+ hours. We get that. That’s why we design games you can play without dedicating your whole evening to them. Sure, $60-$100 games are cool. But we want to make sure that price is not a barrier to fun. Even though we’re a small company, we want to make sure you’re getting a good value at a low price point. 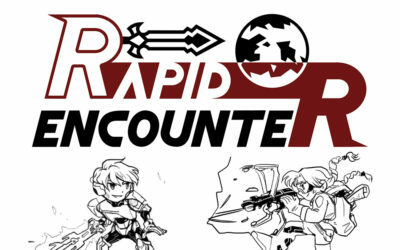 Rapid Encounter shrinks down the strategic battles of classic Japanese Roleplaying Games (JRPGs) into a micro-game that fits in your pocket. It was wonderful meeting everyone at GeekGirlCon ‘18. This was our first year at GeekGirl and it won’t be our last! Are you in the Seattle, WA area this weekend? 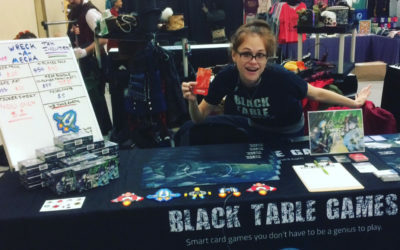 Come join us at Geek Girl Con October 27 & 28 at the Black Table Games booth (#200). Do you have a question or comment? Do you need some site support? Interested in selling one of our games in your store? Would you like to setup an interview? For brand assets, visit our logos page. Enjoy the updates online but wish we were closer? Like in your pocket? But only once a few times a month or so (you're not looking for anything serious)?